A new study saw universities in South Korea come out on top with businesses investing about €72,959 in each scholar to carry out research on their behalf. Students at Trinity College in Dublin. 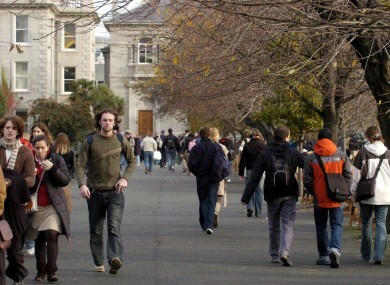 UNIVERSITIES IN IRELAND are the worst at attracting funding from big businesses, according to a new study ranking 30 countries. Ireland came in last place in the study conducted by Times Higher Education (THE), with the UK not faring much better in 26th place. South Korea topped the list with businesses investing the equivalent of €72,959 in each scholar to carry out work in innovation and research on their behalf. Singapore, in second place, brings an average of €63,425 per academic. Here, our universities attract just €6,299 per researcher from the industry and in the UK it’s €9,983. Commenting on the study, Phil Baty, editor of THE World University Rankings said the fact that South Korea and Singapore are the top two countries listed in the new table, with other Asian nations like Taiwan, China, India all making the top ten will be a “shocking wake-up call for the West”. However David Docherty, chief executive of the British Council for Industy and Higher Education suggested the THE figures understate the level of commercial engagement with UK industries. Baty said that working with business and industry to move ideas into the real world has become one of the most important functions of a modern university and for some the ability to attract funding could be a case of “sink or swim in this age of austerity”. Email “Irish universities are the worst in the world at attracting business funding”. Feedback on “Irish universities are the worst in the world at attracting business funding”.